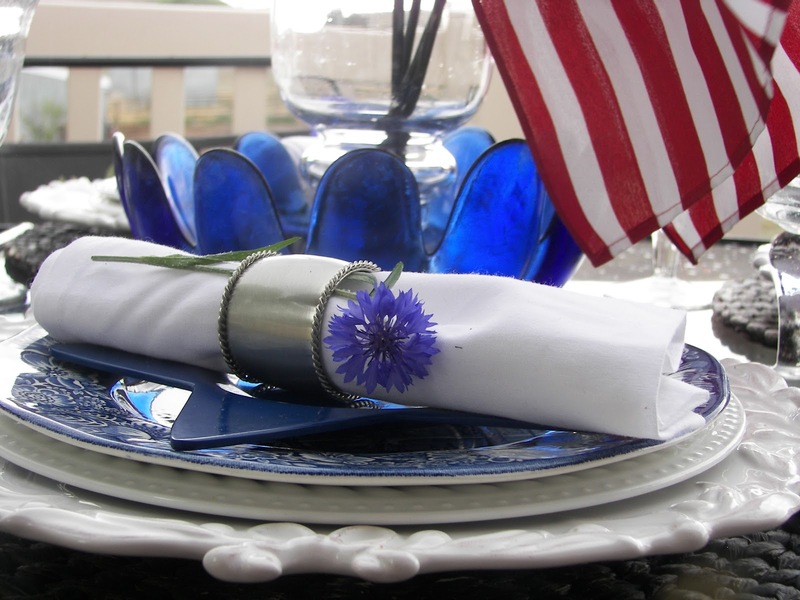 Welcome to Red Couch Recipes and my Liberty Blues Tablescape for the 4th of July! The Liberty Blue line was produced for the United States' Bicentennial in 1976. They were an incentive for customers of the Ben Franklin Savings and Loan and later were used as promotion items at grocery stores. If I would have been older then, I would have been all over these. As a young girl, I conned asked my mother to buy me a series of history books. Later in college I wanted to become a history major, but felt that I couldn't get a job and took a different direction; I did get a history minor. 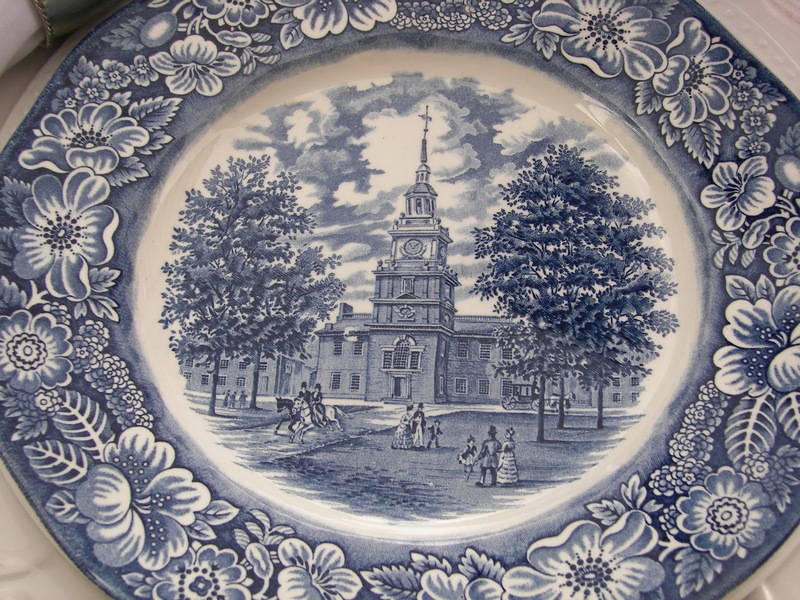 The dinner plates feature Independence Hall and other pieces feature historical people or scenes such as Monticello or Betsy Ross. I love the border of the plate. I first saw this pattern on Beth's, Beyond the Garden Gate blog and fell in love with it. Thanks Beth for the tip; it is readily available on Ebay. I tucked a Bachelor Button inside each napkin ring. Last year my dear husband sprinkled wildflower seeds all over in the bare spaces of our backyard -- these Bachelor Buttons came back this year-- love them. I bought the blue "daisy" bowl years ago. It is very impractical as it cannot hold much -- it works to add color to the table. I really, planned to do a table without red this week, but what would the 4th of July be without flags? I hope you have a great 4th of July and take a bit of time to remember our founding fathers who bravely took the step to declare our Independence 235 years ago. This table is amazing. I love those blue plates! 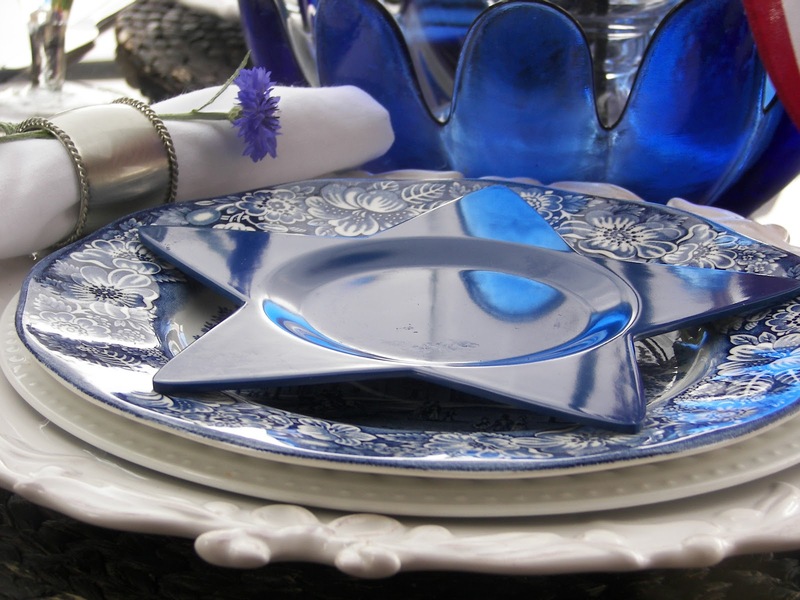 I have some star plates like yours that I got last year for my birthday and I will feature them on my 4th of July tablescape. I love bachelor buttons - they keep on coming up year after year with a beautiful shot of blue just when it's needed. Those star plates are special! Great minds think alike! I used the same plates. Got mine on Ebay too. The blue plates are so pretty. I may be the only dish addict on the planet without a blue and white set--love these! Thanks for dropping by. Tuesday we ate the cupcakes, yesterday we got pedicures, today we are going to get wedding cake flavored sno-cones!! Trying to keep the mom to be busy! Love the bachelor buttons but have never had success with them. Happy 4th! Great job on the table! I like all the blue. Love that star plate! Beautiful! 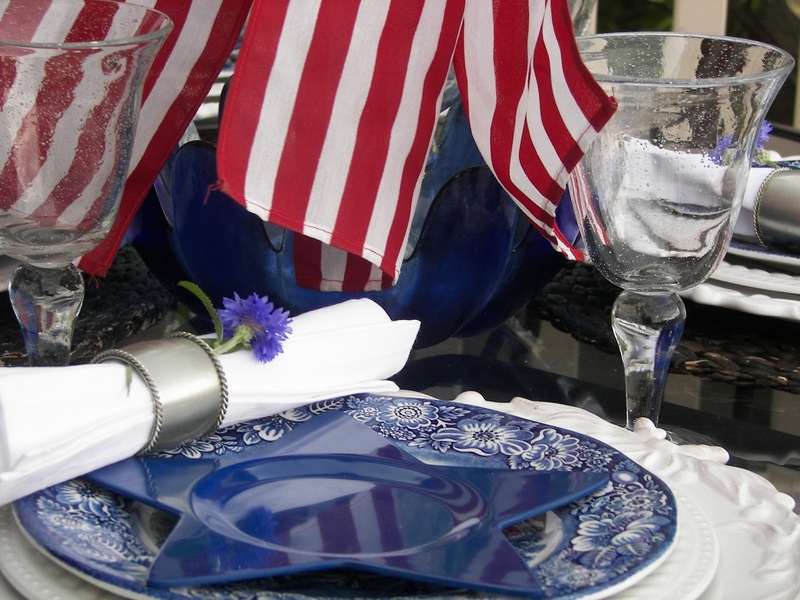 The Liberty Blue is one of my favorites...I had serving for 24, but have pared down to 12 placesettings, which I bought weekly at the grocery store back when they first came out. It's great, and the bachelor button at each napkin was my favorite part for some reason. There was just such a sweet simplicity to it. And of course you had to have some red. It just wouldn't have been right to have a patriotic table at the Red Couch without it. Using the flag to achieve it? Just perfect. Hi Joni, Thanks for the mention. I do love Liberty Blue! I first saw it on BJ's blog, Sweet Nothings. I believe Christine from Christine's Home and Travel Adventures has it too. It is great for 4th of July, but really it's great anytime! Love the plates! I agree with you, Joni...You have to have flags for the 4th of July. Your Liberty blues are beautiful. What a fun table you put together for the 4th! I love the star plates too. You always make all of the holidays so nice. Enjoy your 4th of July. Such a pretty table!! I never think I am a blue person until I see someone do a blue table...this is beautiful and the red does make it look very 4th of July. Very pretty! 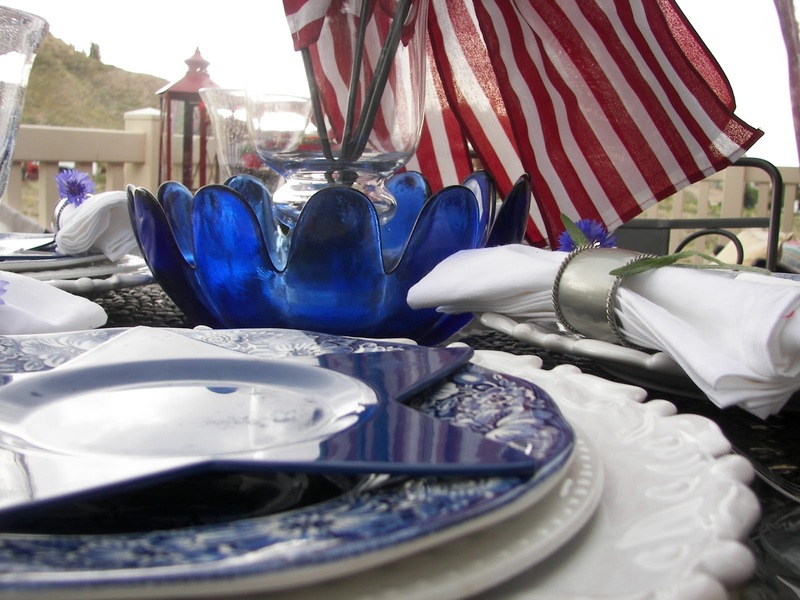 Love your patriotic tablescape. I especially like those gorgeous Liberty Blue plates. 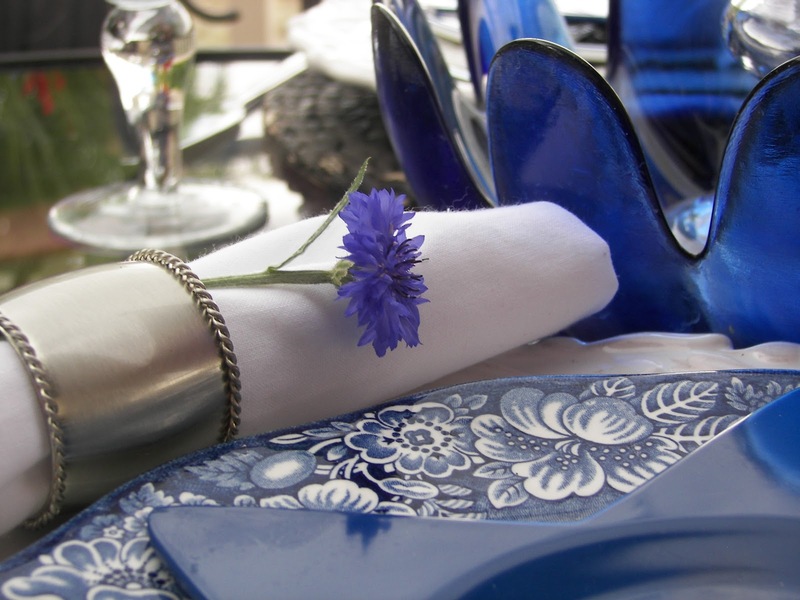 Love how you have tucked the sweet bachelor's button into the napkin ring.